Most pet owners love to sneak their pooch a table scrap or two on Thanksgiving, but pet experts say it’s critical to make sure you know which Thanksgiving foods are safe to give to pets. Most of the dishes on your Thanksgiving menu are dangerous to give your furry family member in large amounts, primarily due to their high fat content. In an interview with ConsumerAffairs, Petplan’s staff veterinarian Dr. Jennifer Maniet noted that the most common pet hazards during the Thanksgiving holiday are related to the ingestion of dangerous food. Such foods as chocolate, raisins, grapes, and desserts can contain the sugar substitute Xylitol, which is toxic to both dogs and cats and can cause organ failure. The potential health effects of allowing pets to eat from your plate include severe pancreatitis, food poisoning, vomiting, and diarrhea. Additionally, pet owners shouldn’t give pets leftover bones. Brittle bones splinter easily and can cause serious problems for pets including tongue or mouth lacerations or even an obstruction in the stomach or intestines. Amid the hustle and bustle of Thanksgiving festivities, it can be difficult to make sure pets don’t accidentally eat something they shouldn’t. To help ensure well-meaning guests don’t accidentally sicken your pet, Maniet offered the following advice. “Advise your guests and your family to not feed your pets any table scraps. If they cannot resist slipping a few treats, then I recommend using your pet’s regular kibble in small amounts,” she said. “Also, I recommend adjusting the time you feed your pets so that as you sit down to eat dinner, your pets can simultaneously be chowing down on their own pet food,” she added. And when the meal is over, be sure to clear out remnants of food that may be tempting to your pet. 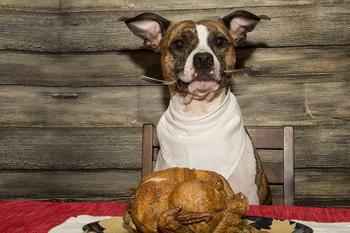 While many Thanksgiving foods can potentially cause adverse health effects, other Turkey Day treats are perfectly fine to feed Fido in moderation. As long as your pet does not have any food allergies or sensitivity (and you keep treats to less than 10 percent of your pet’s daily caloric intake) the following Thanksgiving-themed homemade treats can be given your pet. Pumpkin Smoothies. Just two ingredients are needed to make this creamy, pet-friendly pumpkin drink. Peanutty Crudités. Veggies and peanut butter are key ingredients in this treat. Simple Sorbet. A refreshing ice cube treat for pets. Roasted Turkey Medallions. This protein-rich snack is made from turkey, carrots, and oatmeal. Scrumptious Sweet Potato Cookies. Sweet potato and banana are the main ingredients in this low-calorie cookie. How much chocolate is toxic to your pet?